The latest season of Game of Thrones has ended , and it looks like winter really is coming to Punta Arenas now. A few weeks ago I thought I saw snow… that was only the pathetic stuff we get at home on a good day. A bit of snow and slush on my walk back from work and then the next day it’s gone. The only place it stayed put was up on the hills surrounding the city, where the closest national park is. Last weekend the real snow hit. Changing from blistery winds to sunny skies in the space of a few minutes, this is what a real snowy city is like! And guess what Britain… The world doesn’t stop when it snows! You just carry on with life as normal, albeit at a slower pace, and with many more layers of clothing. The cars drive slower and take forever to brake, everyone shuffles a bit more on the pavement and people are just a bit late to their meetings (yes, even later than they normally are). Even the horses have small “studs” on their shoes to help them on the frozen paths! Walking back from school one day I managed to get a picture of the police on their patrol, just after one guy had stopped to clear the ice out of the hooves with some handcuffs. I very nearly didn’t bring my walking boots to Chile, in an attempt to pack lighter, and not yet knowing where I’d be, I thought I could make do with what I had. If I did go walking I could just wear my trainers, which I successfully used for 5 months on very rocky terrain. Thankfully a holiday in the Lake District before I left reminded me that I love walking and wherever I am in Chile I will want to go hiking and the best shoes for that are my hiking boots. Paired with my waterproof Sealskinz socks and my new ski trousers (bought for ~£6 from the street market!) I was ready for anything! Despite the snow that hit last weekend, I had already planned to go walking with another volunteer and some new Chilean friends so we got up very early in the morning ready for a day of hiking up Monte Tarn. Not being used to the frozen ground I managed to fall flat on my bottom while trying to “quickly” pop back in the house for something I’d forgotten. You’re forced to take things a lot slower in this kind of weather, whether you’re late or not. With the roads covered in snow we all squished in to the car, and started heading even further south. It’s about an hour and a half drive to the start point of the walk, but we didn’t manage to make it that far. We quickly realised that there really was too much snow but we thought we’d go for an adventure anyway. Behind us as we drove south we got a great view of sunrise, which currently is at around 9:30am, and the world slowly waking up for the day. We made it as far as Puerto Hambre where we all got out for a little wander, and it felt like we were at the end of the world! The beach was covered in snow and ice right by the water, and the rocks were all jaggedy giving a view that pictures just don’t do justice. On our way back we tried to visit the Laguna Parrillar national park, but this was also closed due to the snow. Driving up to the entrance was like being in a winter wonderland, the bare trees with a dusting of snow and icy blocks all along the side of the road. There was so much snow that even though the park was closed, we had to go in just to turn around! That didn’t stop us from getting out, admiring the frozen lake, having a snowball fight and taking silly pictures. After a blustery lunch on the side of the road, we weren’t quite sure what to do with the rest of the day seeing as all the places to go walking were shut. So one of the Chilean guys, who just so happens to be a pilot, said that he could take us flying instead. My Spanish still isn’t brilliant, so as all of this was being discussed in the car I wasn’t quite sure if I was hearing things right. 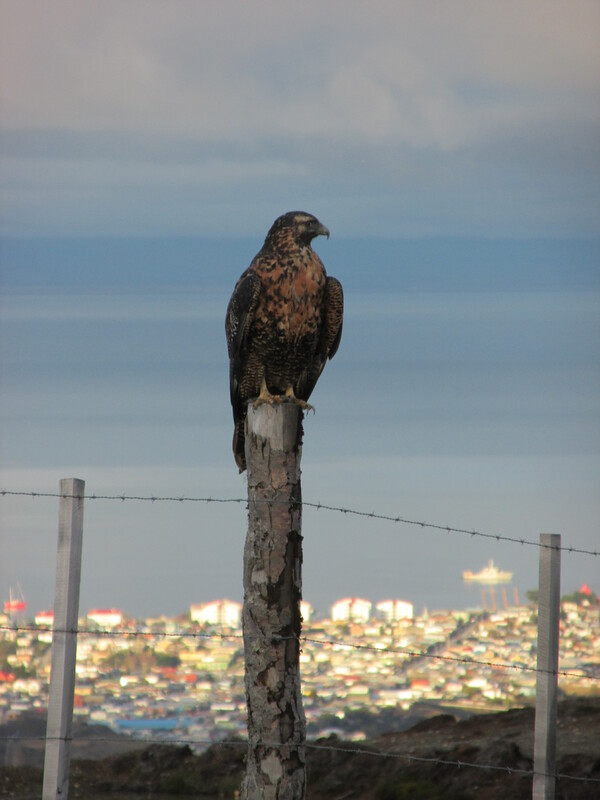 Driving straight through Punta Arenas without a stop and on to the airport north of the city, I knew I’d heard right. Skipping the tiny commercial airport we went to the flying club hanger where we started getting the small 6-seater plane ready. It’s quite a task trying to move an aeroplane when the tarmac you’re trying to walk on is like an ice rink! It’s like a toy plane compared to the big passenger airlines! Still not quite believing what was happening, we all hopped in the plane, the pilot sorted out everything and we went over to the runway and took off in to the sky. On one side was the snow covered hills, and then on the other was the city of Punta Arenas set against the Straight of Magallanes. Seeing the city from above I managed to spot a few landmarks, and even found the school where I’m currently volunteering! After a circle over the city we landed back on solid ground and I was still trying to work out in my head how a day planned for hiking through the snow managed to turn in to a childish adventure with snowball fights and a flight over the city!! I’ve found that most thing here don’t go to plan, but that doesn’t necessarily make it a bad thing. The weekend before my flight over Punta Arenas, me and some other volunteers tried to visit the closer national park, Reserva Nacional de Magallanes. It’s a 15-20 minutre drive out of the city and seems like a good way to see nature, which is great for someone like me who struggles being in a city too long. Unfortunately while the roads in the urban area were clear, up in the hills was another story. We’d gotten a taxi up and so instead of just going straight home, we decided to walk back. This gave us some nice views over the city and we even saw a rainbow adding some colour to the sky. Just below the snowline when I was thinking the walk is getting boring (no snow, on the main road so lots of cars, more houses) a car coming towards me slows down… and it turns out to be my host who is about to hike up the ski slope hill! So we all hopped in the car and managed to have just enough sunlight left to trudge all the way up the top. Easier said than done when one step on softer snow means falling thigh-deep in to the ground! I managed to get by in just my normal trousers, but some ski trousers would definitely have been better. Despite the deep snow and lack of proper kit (tennis racquet-style snow shoes would’ve been useful! ), we carried on all the way to the top. We were rewarded with a view of the city, a sunset and some coffee in a thermos. This week has seen me adapt to wintery conditions, wearing walking boots to school and layering up in all the thermals I own, something radically different from the last time I lived abroad, where I was trying to wear as little as possible due to the heat, while still being conservative with my clothing. The weather here has warmed up a bit now (you know, to just above freezing) so it’s raining again and a lot of the snow on the pavements has been compressed to ice. Everything is slowly thawing and day-to-day movements are quickening, but you still need to watch out for those icy patches. I have no doubt that we’ll get more snow, so I think it’s about time I start planning my winter holidays and I think it’s going to be somewhere a lot further north! Punta Arenas is somewhere i always wanted to visit! Enjoy the snow, it looks great.